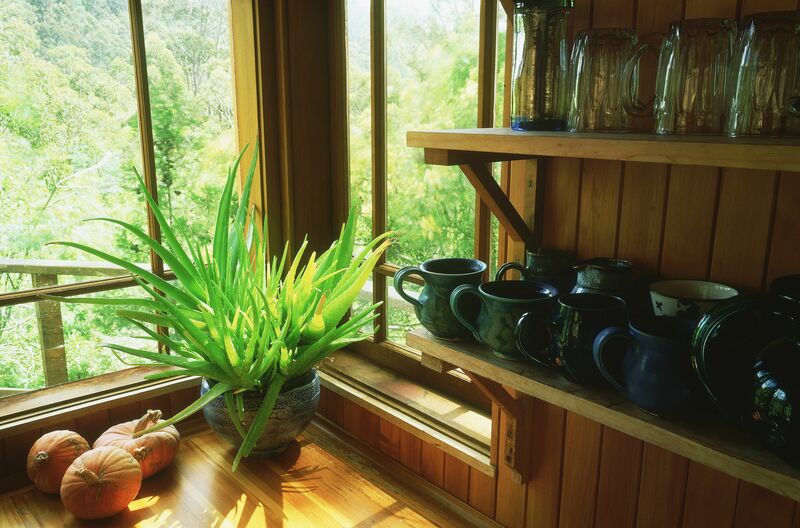 Bright rooms and south-facing windows seem like a boon to houseplants at first glance, but in reality, many houseplants can experience leaf scorch from too much sunlight. Many houseplants come from jungle regions where the tree canopy constantly filters the light. However, some plants, especially those native to South Africa and Australia, need ample sunshine to thrive. You can transform a bright room with a pretty planter and one of these houseplants that crave the sun's rays. Add to your first aid arsenal with a low maintenance aloe vera plant. The sap provides ready relief for minor cuts and burns, and plants are easy to propagate by repotting the pups. Plant your aloe vera in a heavy terra cotta pot that will both support the top heavy growth, and encourage air circulation. You can also mound soil around the stem to provide support for flopping plants. With its sturdy stems and interesting, fleshy leaves, jade plants have endured as a popular houseplant for those with sunny windowsills or bright conservatories. Jade plants need at least four hours of sunlight each day, so a south-facing window is ideal. Although the Crassula argentea is a succulent, and therefore drought-tolerant, it is not a cactus. Keep your jade plant moist by watering it when the soil surface is dry to prevent shedding leaves. Jade plants can live for decades and continue to grow slowly over time, so keep your plant in a suitably heavy pot to prevent it from toppling over. The sago palm (Cycas revoluta) is a slow-growing cycad that fits into modern decorating schemes well. It produces no flowers and rarely sheds its leaves, making it a tidy choice for the bright bedroom or living room. Got curious cats or nibbling toddlers? This plant is very poisonous, and should not be around pets of kids that might give it even a cursory taste. Euphorbia trigona is an unusual looking plant that often elicits strong feels of affection or dislike. Although not a cactus, this succulent does grow sharp spines that can make repotting a challenge. The African milk bush is strictly a tropical plant, and if you give it a summer vacation outdoors be sure to bring it back in before temperatures drop below 50 F.
This popular "impossible-to-kill" houseplant is carried in most garden centers as an ideal specimen for those new to houseplants, or those too busy to provide much care to their plants. Sansevieria trifasciata does great in bright light, but it will grow in shady conditions as well. If you are lucky, your snake plant might even reward you with a flush of fragrant white flowers. The same plant the Egyptians used to build boats and make paper also happens to be an interesting houseplant specimen for sunny spots. The key to growing a happy papyrus plant is to give it constant moisture. Papyrus grows as a pond margin plant, so it is accustomed to having wet feet. Place your container in a dish of water and change it weekly to prevent it from becoming stagnant. The croton is proof that foliage can be every bit as lovely and vibrant as flowers are. Do not overwater your croton plants; only water when the soil surface feels dry. Croton plants need warm temperatures to thrive and may experience dieback if temperatures fall below 60 F.
The swollen trunk and frizzy foliage of the pony tail palm make it a fun accent plant for the sunny kitchen or family room. Care for your ponytail palm as you would a succulent plant. Give it coarse soil amended with sand and water weekly. The ponytail palm grows slowly and will only need repotting once every year or two. No houseplant brings larger flowers indoors than the tropical hibiscus. A site with strong light is essential to achieving blooms when growing the hibiscus indoors. Pinch your plants monthly to keep them compact and branching and feed them regularly with a potassium-rich houseplant fertilizer. To keep your hibiscus healthy provide regular moisture but make sure you do not leave the soil soggy. The areca palm is a grand specimen for entryways or living areas with vaulted ceilings. The plants can grow about six to eight feet tall indoors and have a spread of several feet. Areca palms need little other than a sunny space and occasional watering. Make sure no water is left standing in the dish under the pot. Gardeners covet jasmine vines for their highly fragrant flowers that appear in late winter. White jasmine blooms are simple but plentiful, and a few cut stems make any flower arrangement special. Jasmine plants like bright but not direct sunlight. They need humid conditions, and a summer vacation outdoors will increase their longevity and performance. Senecio rowleyanus plants are a fun conversation piece tumbling over the edge of a container or hanging basket. The succulents like bright indirect light, sandy soil, and infrequent watering. Cuttings are easy to root, so you can share some of this whimsical plant with your friends.